Holy Week at the monastery was indeed a special time for our community. On Holy Thursday morning through Holy Saturday, we will celebrated the Tenebrae service or “Service of Darkness” which anticipates and mediates on the Lord’s suffering. Included in this early morning service are the recitation of Psalms, readings, singing of the Lamentations of Jeremiah the Prophet and the lighting and subsequent extinguishing of the Tenebrae candles. A special observance of silence starts after the Mass of the Lord’s Supper on Holy Thursday night which gave a fitting atmosphere of prayer and reflection in the monastery on Good Friday. Of course, the culmination of the celebrations will take place on Saturday night at the celebration of Lord’s Resurrection at the Easter Vigil Mass. 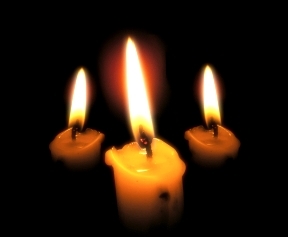 In addition to the Liturgies listed below, all are welcome to attend the Tenebrae services at 7 a.m.
April 18th at 8:00 p.m.
April 19th at 1:30 p.m.
April 20th at 8:00 p.m.
April 21st at 9:30 a.m.
Tenebrae services will take place Thursday through Saturday at 7 a.m.
For last week's news story, click here.